Reclusive occult expert Dr. Plato Zorba has died, leaving his furnished mansion to his penniless nephew Cyrus and his family — along with the ghosts that he’s managed to collect, who seemingly are out to kill someone in the house. Actually, 13 Ghosts is quite enjoyable — the acting is good, and the film actually spends a little bit of time setting the scene before getting to the haunted house. The Zorba family is functional, loving … and broke, as the movie begins with their furniture being repossessed. The family tries to celebrate their son Buck’s birthday that night anyway, where the birthday boy 1) shows his love of ghost stories, and 2) makes his birthday wish for a house that they own, complete with furniture — and the scary wind blows through an open window, and there’s a knock at the door … it’s a lawyer, telling them of their new inheritance. Once they’re all there, and the lawyer has set the mood telling the family that he actually believes in the deceased’s stories of ghosts they … decide to play with an Ouija board, nearly ending with an accidental death. Admittedly, it’s a foolish thing to do in a haunted house, but it does move the story forward, with a ghostly prediction of an upcoming death. 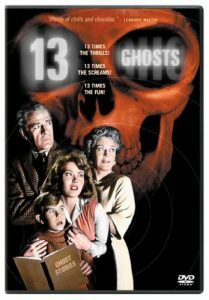 In all, 13 Ghosts will never be mistaken for high art, but it’s definitely an enjoyable film, and probably a wonderful film for a family to watch together on Halloween, Friday the 13th, etc. Hilda Zorba (Rosemary DeCamp, Yankee Doodle Dandy). The lovely wife and mother, who supports her husband through everything. Cyrus Zorba (Donald Woods, Wonder Man). The husband and father, who invites the haunted house – and is determined to keep his family safe. Van Allen: Oh Cy, where are you? Cyrus Zorba: Explaining how man survived the Pleistocene age. Van Allen: How did he? And why? Hilda Zorba: The moving men are here again. Cyrus Zorba: They won’t wait? Cyrus Zorba: Not till tomorrow? Buck Zorba: [making a birthday wish] I wish we owned our own house, and all our furniture that nobody could take away. Buck Zorba: [to Ben] There’s a witch in the house. Ring the bell; she’ll answer. Buck Zorba: What’d you do that for? You should’ve let the Witch answer it. Medea Zorba: You need to stop calling her that or she’ll cut your tongue out. Van Allen: All you have to do is find Elaine Zacharides. Cyrus Zorba: I don’t have to find her. She’s the housekeeper. Ben Rush: Are you all moved in? Buck Zorba: There wasn’t anything to move except us. Buck Zorba: There’s furniture and books and most of it I haven’t even seen yet. Buck Zorba: That was Emilio. Buck Zorba: He doesn’t mess up the kitchen often, but when he does, WOW! Buck Zorba: . Now Emilio is through. Medea Zorba: [Ben has just brought Medea home] That was a wonderful evening Ben, thanks. How about some coffee before you go? Ben Rush: No, thanks. Not tonight, I sure wish you and your family were staying somewhere else; this place gives me the creeps. Medea Zorba: Oh don’t start with that again. Ben Rush: Well I worry about you, Medea. Just for me will you try to be a little careful? Medea Zorba: For you, I’ll pull the covers over my head tonight. Ben Rush: [smiling] See you tomorrow? Medea Zorba: I hope so. Good night, Ben. Buck Zorba: [as Ben walks in the door] Ben, I found it! Ben Rush: Good boy! Have you told anyone else about this? Buck Zorba: Course not! Let’s tell them now. Buck Zorba: Ow! You’re hurting! Ben Rush: Sorry, Buck. We can’t tell them yet. Buck Zorba: But we’re moving out tomorrow! Buck Zorba: You really are a witch, aren’t you? Elaine Zacharides: Ask me no questions, and I’ll tell you no lies. Several people call Elaine Zacharides (played by Margaret Hamilton) a witch. Margaret is even carrying a broom when we first see her, which Charles points out. Margaret Hamilton played the Wicked Witch in The Wizard of Oz. William Castle films are famous for their publicity gimmicks, and 13 Ghosts is no exception: The movie was filmed in “Illusion-O” and a special viewer was needed to enhance the ghosts or make them invisible. The “ghost viewers” contained a red filter and a blue filter, but unlike 3D viewers/glasses, both eyes would look through the same color filter. The red filter would cause the ghostly images to intensify while the blue filter caused the images to fade.